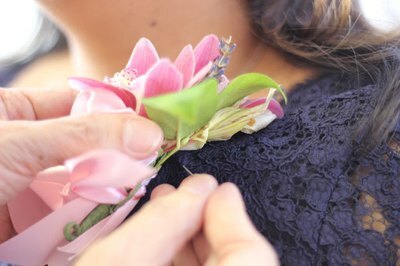 Wrist corsages are popular for proms and weddings, but as easy as they are to slide on a wrist, some people are confused about the proper way to wear them. Here are some guidelines for wrist-corsage etiquette that will have you looking your stylish best on that special day. The general rule is to wear your corsage on your non-dominant arm – the non-writing arm. Approximately 90 percent of the population is right-handed, so most women wear wrist corsages on their left arm. In a wedding, if the majority of the bridal party is right handed, it is customary for the left-handed bridesmaids to wear it on the left as well so that there is consistency. Which Direction Should the Flowers Face? If the wrist corsage looks similar from all sides, it does not matter which direction you wear it. However, if the flowers face one way while the stems face the opposite direction, the corsage looks best when you wear it with the flowers facing your fingers and the stems facing your elbow. The reason is that when your arm is at rest in front of you, the flowers would be facing outwards, towards people, and very importantly, the photographer. 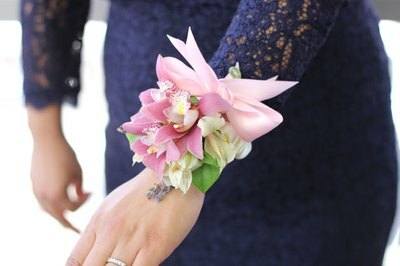 Wrist corsages for prom tend to be more adventurous than traditional wrist corsages worn at a wedding. The flowers can be bigger and brighter, and one single flower can make a bold fashion statement. 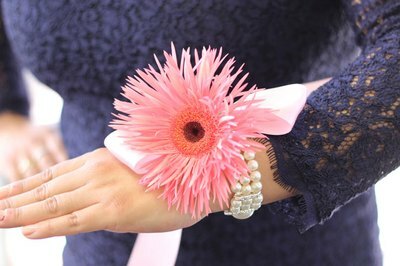 Also, there can be more bling for a prom corsage, which can be incorporated in the bracelet. The wrist corsage would be worn the same way, with the flowers facing forward for photo opportunities. If the bracelet is sparkly, try not to cover it with flowers. 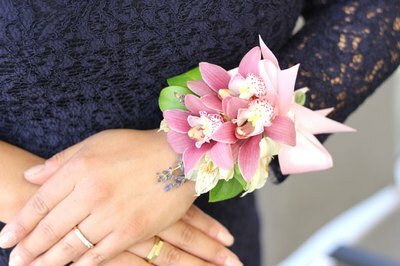 Many mothers and grandmothers of the bride and groom prefer traditional corsages to wrist corsages. Often, they might want to wear the corsage on their wrist at the ceremony and then place it on their gown for the reception. Because of that, it's a good idea to make sure their corsages are convertible so the flowers can be removed from the wristlet.